A thermometer used to measure the temperature of human body. A clinical thermometer has a constriction near the bulb in it. Due to this, mercury thread does not fall on removing the bulb from the mouth of the patient. It has a bulb of very thin glass attached to a capillary of the very fine bore. The bulb is long and thin instead of spherical. This helps the mercury in the bulb to acquire the patient's temperature more quickly and precisely. In Fahrenheit, the thermometer has the markings from 940 f to 1080 F. The normal temperature of a healthy person is 98.60 F, which is indicated by a red arrow on the scale. In Celsius degree, thermometers have markings from 350 C to 42 0 C. The normal temperature of a healthy person in degree Celsius is 370 C.
This thermometer is used to measure the maximum and minimum temperature of a particular place within 24 hours. The one part of it shows maximum temperature and the other part shows minimum temperature. Construction: It consists of a large cylindrical bulb A connected to one end of a U-shaped glass tube BC, the other end of which is connected to a small bulb D. The large bulb A and part of the stem of the U-tube are filled with alcohol. The bulb D is partly filled with alcohol, with some place left at the top to allow for the expansion of alcohol. 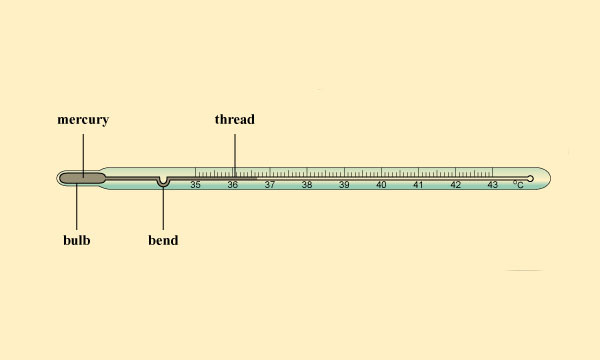 The bend of the U-tube contains a thread of mercury. A small steel index is in contact with the level of mercury in each limb of the U-tube as shown. Two scales are provided to measure maximum and minimum thermometer. Working: When the temperature of the surrounding air rises, the alcohol in bulb A expands, pushing the mercury down the limb C. Along with it, the index in limb C is pushed up to the extreme position reached. This position corresponds to the maximum day temperature. At night, the temperature of the air falls and the alcohol in bulb A contracts. This contraction causes mercury to rise in limb C. The index in limb C does not fall with mercury, it remains to stick to the wall at its maximum thermometer height. The rising mercury level in limb B carries its index with it which attains its extreme position when the minimum temperature is reached at night. The lower end of the index in limb C records the maximum temperature whereas the minimum temperature is given by the lower end of the index in limb B of the thermometer. The resetting of steel index is done to help a magnet in order to record the maximum temperature of the day. Laboratory thermometer consists of a bulb with a long capillary tube. The wall of the bulb is made thinner and the capillary tube is made narrower to make the thermometer more sensitive. Mercury thermometer expands and contracts according to the rise or fall in temperature. Laboratory thermometer can be used to measure both hot and cold substances. Usually, laboratory thermometer is made in Celsius scale which has the scale from -100 C to 1100 C.
A clinical thermometer is used to measure the temperature of human body. Maximum and minimum thermometer is used to measure the maximum and minimum temperature of a particular place within 24 hours. Laboratory thermometer consists of a bulb with a long capillary tube. The wall of the bulb is made thinner and the capillary tube is made narrower to make the thermometer more sensitive. Clinical Thermometer - Mercury and Digital. Write short note on clinical thermometer. A clinical thermometer has a constriction near the bulb in it. Due to this, mercury thread does not fall on removing the bulb from the mouth of the patient. It has a bulb of very thin glass attached with a capillary of a very fine bore. The bulb is long and thin instead of spherical. This helps the mercury in the bulb to acquire the patient's temperature more quickly and precisely. In Fahrenheit, the thermometer has the markings from 940 f to 1080 F. The normal temperature of a healthy person is 98.60 F, which is indicated by a red arrow on the scale. In Celsius degree, thermometers have markings from 350 C to 42 0 C. The normal temperature of a healthy person in degree Celsius is 370 C.
Write short note on laboratory thermometer. Laboratory thermometer consists of a bulb with a long capillary tube. The wall of the bulb is made thinner and the capillary tube is made narrower to make the thermometer more sensitive. 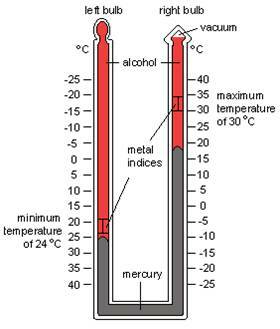 Mercury thermometer expands and contracts according to the rise or fall in temperature. Laboratory thermometer can be used to measure both hot and cold substances. Usually, laboratory thermometer is made in Celsius scale which has scaled from -100 C to 1100 C.
What is maximum and minimum thermometer? Thermometer which is used to measure the maximum and minimum temperaature of a particular place within 24 hrs is called maximum and minimum thermometer. This kind of thermometer has both alcohol and mercury. The thermometer which is used to measure the human body temperature and as mercury as thermometric substance is called clinical thermometer. The thermometer which is used in laboratory to measure the temperature of substances between the temperature -37oC. to 357oC. The thermometer which is used to measure the temperature of a human body and has mercury as the thermometric substance is called clinical thermometer. This thermometer is used to measure the maximum and minimum temperature of a particular place within ______. The maximum and minimum thermometer is ______. In Celsius degree, thermometers have markings from______. In Fahrenheit scale, the thermometer has the markings from______. Laboratory thermometer is made in Celsius scale which has scale from ______. Any Questions on 'Types of Thermometer According to Construction '?